1776, 1789-1799 and 1815 are all key dates, not only in western history but also the career of the charismatic Tipu Sultan or “Tiger of Mysore”, who stalwartly resisted the East India Company’s expansion into southern India. Tipus’ father, Haidar Ali, was considered by the Americans to be, along with the French, a vital ally against the British in the Revolutionary War of 1776. At the same time that Haidar was fighting his final campaign in the Anglo-Mysore wars, Washington was leading his forces to victory at Yorktown. His opponent, the defeated General Cornwallis, came to Mysore during the French Revolution and waged war against Tipu, who now ruled the Mysore kingdom. During the last Anglo-Mysore war of 1799 the British were desperate to foil Napoleon’s plan to invade India. Napoleon had promised Tipu he would relieve him from “the iron yoke of England”, but it was not to be: Nelson sank Napoleon’s fleet off the coast of Egypt, and Colonel Wellesley, later the Duke of Wellington, aided by a traitor defeated Tipu, bringing to an end in 1799 the Muslim ruler’s dominance in southern India. In a final cruel twist of fate, Tipu’s ingenious rockets which, terrifying his opponents with their wall of fiery destruction, had been used to great effect in the Anglo-Mysore wars were brought back to England, re-engineered by William Congreve and turned against his former ally at the Battle of Waterloo, ending French dominance of Western Europe. I was regaled with tales of the battle that led to Tipu’s demise and a great deal more at the fort of Seringapatam, which is situated just outside Mysore; there is nothing quite like standing on an actual historical site to get the full flavour of the past. 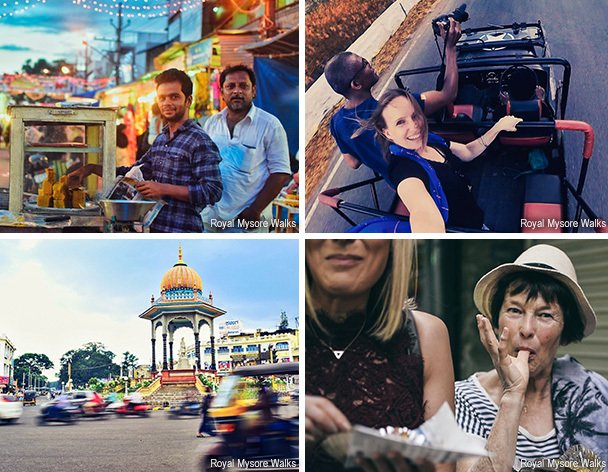 A visit to Mysore, however, provides more than just history: there are foodie tours in the town, learning to cook with a local family, cycle tours, vintage WW2 jeep rides as well as stories about the palaces and Maharaja’s antics. Shopping here, with market stalls laden with sandalwood, perfumes and incense, is an olfactory paradise. 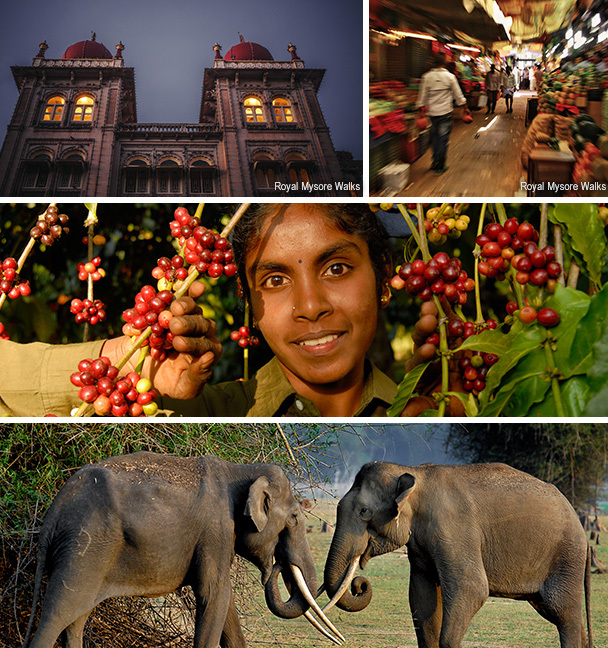 Mysore is also a great starting point for a tour of Southern India that takes in the Coorg coffee estates and wildlife haven of Nagarhole and where the pace is gentler than the busyness of Rajasthan. This is a land of wild forests, large lakes and gladed clearings where there is a chance to see tigers and sightings of elephants are almost guaranteed! The Kodavas, as the people of Coorg are called, are reputed to be the descendants of Alexander the Great. They never returned to Greece after his Indian campaign and seem to have retained their warrior tradition, fighting with the British against Tipu, the mighty Muslim warrior, and continuing to serve in the Indian army in high numbers today. As you drive through small towns, you may still catch a glimpse of men wearing the traditional warrior dress – a robe with an ornate silver dagger tucked into the sash. The Kodavas are ancestor worshippers; at their harvest festival families march with blazing bamboos into the paddy fields, singing chants invoking Igguthappa, the god of paddy production. Although last year there was a plethora of withering critiques in the press of the adverse effects of colonial rule, the British did encourage coffee production and by the mid-19th century the region had increased significantly in prosperity. Today the lush hills are dotted with neatly trimmed coffee bushes protected from the scorching sun by silver oak trees wrapped in pepper vines and interspersed by vivid displays of poinsettias marking the estate boundaries. 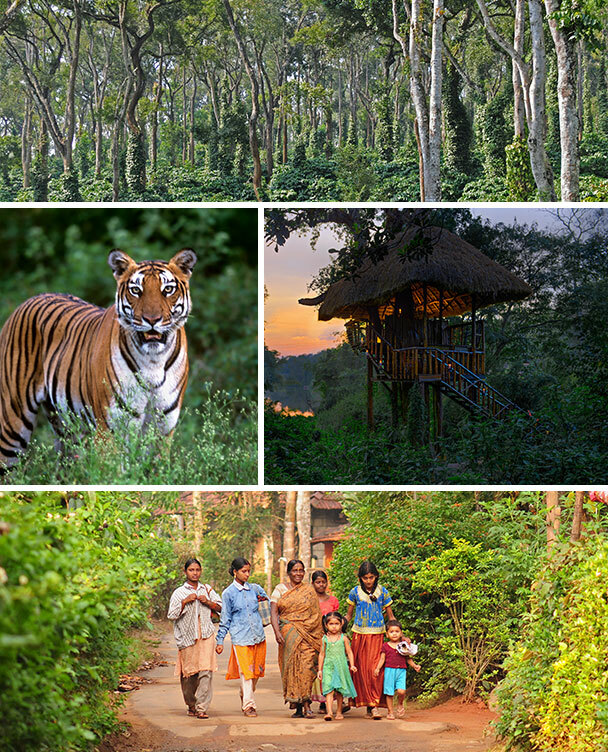 So a discovery of southern India encompasses wildlife, coffee estates, Kodova culture, and historical global alliances – all to be found in the province of Karnataka whose southern reaches are neatly sandwiched between the temple state of Tamil Nadu, calming Keralese backwaters and the Malabar coast. PS Tipu Sultan is considered to be the founder of rocket power and there is a picture of his army using his rockets at the NASA Space HQ in America. His favourite mechanical toy is also on permanent display at the Victoria and Albert Museum; I shall leave you to discover what exactly it is! For further information on Indian holidays please contact Miles on 0207 723 5858.